“Speak in such a way that others love to listen to you. Screw season has once again settled over the campus. Love and awkwardness are in the air. Each year for a swathe of time in the fall, hundreds of Yalies funnel their creative energy into browsing ID photos on Yale Facebook and executing elaborate set-up schemes to help their suite-mates find a one, true screw date. But in a sea of couples, it takes going the extra mile to stand out. XC sat down with pairs of students to hear their most bizarre and interesting screw set-up scenarios. [continue reading] The art of the screw | Cross Campus. And you thought that expensive tuition was for learning? THERE IS a valid argument AND unfortunate reason for today’s word. And there are other words that carry as much weight on a day like today. Today’s word is personal to me. Before I describe the nature of MY embarrassment, I feel first the need to identify the definition and usage of the word. a feeling of self-consciousness, shame, or awkwardness. a person or thing causing embarrassment. Today my embarrassment is because of when I think about hunger, particularly today, I feel shame and embarrassment. No, today is not my birthday (hatch day)… Mine falls on the last day of the month… and I don’t think the email was about me. The problem started for me when I got yet another email from www.threesquare.org. My email filtering placed both messages right next to each other in my inbox describing the effect SNAP benefit cuts will have on families… starting TODAY. This email was telling me what today means for all of the people who I have assisted as a volunteer to complete SNAP (food stamp) applications. Less food for the invisible face of hunger. It’s about putting an additional burden on ordinary people. An additional burden on part and full-time employees of Walmart and McDonalds. Two of the largest recipients of corporate welfare. Both of them suggesting and assisting their employees in getting help with food… with SNAP (food stamps) instead of paying them a living wage. Yes, the burden on the back of the low income full-time employee being assisted by their employer in getting assistance with government money. My money… Your money. Corporate welfare. I repeat… Walmart and McDonalds. I’m sure there are other I can’t think of who should share the shame of the board of directors of these monsters. This does not include the theft of service from the medicaid system by these corporations. In the case of McDonalds, they throw away a lot of food. Prepared food after “X” number of minutes on/in the line is thrown into the dumpster. This food could be frozen and donated. There is no liability in doing this for the corporation. They are held harmless with food donations. Walmart on the other hand DOES donate, but my feeling is that their donations are a publicity stunt. That money should go to employees, better yet, they operate supercenters… why aren’t they qualifying their employees in the same manner I do before I assist with applications for food assistance??? Why aren’t they providing food for their own employees when there is so much right there in the store??? I’m embarrassed as an American and a human being by first of all, allowing hunger and secondly putting the burden of a partisan budget fight on the back of the under-employed, unemployed… CHILDREN, homeless. I reject the wing-nut image of the SNAP recipient. It’s not the true face of hunger. I see the true face of hunger. Veterans, some of them homeless. My biggest problem is children. I have problem looking at children and seeing them suffer. I want to help them because no one helped me. I want to make a difference. “Hungry does not mean homeless. It may surprise you to learn that, every day, working parents in Southern Nevada face an unthinkable choice between feeding their families and paying the bills. Three Square was founded to help people like this get the food their families need to survive so that they can focus on other things – like getting back on their feet. My volunteering at Three Square started in a warehouse, preparing weekend packs of food for children who may only receive food from school. Their food is easy… either prepared or given with the ability to prepare it without supervision, since many of these children have no supervision at home. This volunteering was at two partner food bank agencies with Catholic Charities and these food bags being distributed to children at school on Friday before they leave for the weekend. Let’s not talk about the summer, when there is no school. The most rewarding time of the year for me was preparing holiday food baskets/boxes/crates. I could be in a warehouse or a kitchen filling a box with fresh fruit and vegetables, turkeys, ham and fixings with books, toys and other things for children. Each box size based on size of family. While not directly exposed to these people in need. I saw their face when I would bring out a box and retreat into the back to prepare more without having to interact directly with these people. It was always just too difficult for me. My emotions take hold ofme when talking of pain and helplessness and hunger. Now I work on the phone, whenever I can at the Three Square main office phone bank. I used to hide, not feeling the ability to listen or help people without getting emotional while seeing, hearing and feeling their pain, particularly when children and military veterans are involved. Contrary to the vocal minority who speaks ill of people in need, these people feel a sense of failure and I wish I had the means to do more. I used to. As embarrassed and ashamed as I may feel about hunger, I can only imagine the thoughts of these people… hungry Americans, yes, Americans, (not undocumented foreigners) who may never have had to ask for help before in their life. That feeling of failure. Not being able to feed yourself or your family. Well, being on the phone, it’s not imaginary anymore. I hear it with my own ears and it hurts me. The last time I was on the phone, completing SNAP applications an incoming call came from a single veteran who was living in a weekly rental across the street from Nellis Air Force Base. Home from deployment four months prior. Dropped at Nellis and left to fend for himself. Debilitating PTSD… worse than mine. Hearing this warrior hero speak to me with voice crackling describing his situation. Unable to work. No substance abuse. Benefits exhausted. The cell phone he called in on had three days before disconnect. His eviction from the weekly one day away. A veteran offered no help. Thrown away after he was used up by our own government. I was confused on how to complete his application because on that day, he had some place to stay. An address. The next day he would not. I had to be told to classify him as homeless and have his application expedited. This application was like being stabbed in the back. One of the first questions we ask on the phone… “are you a veteran?” No transportation. Not enough money in his pocket for bus fare to come to the main food bank. Not even knowing if the address would be valid in the one or two days it takes for the application to reach him for his signature and other personally identifiable information we don’t ask on the phone, for example social security number. I felt as helpless as this veteran… and for all practical purposes, this homeless veteran could be anybody. I did something on that day that I wasn’t supposed to do. It’s against the rules. I wrote his name, address and phone number on a piece of paper and when my shift on the phone was complete, I got on my motorcycle took a picture, not knowing if it would be the last time I could force myself to absorb pain on the phone. It was August 13. 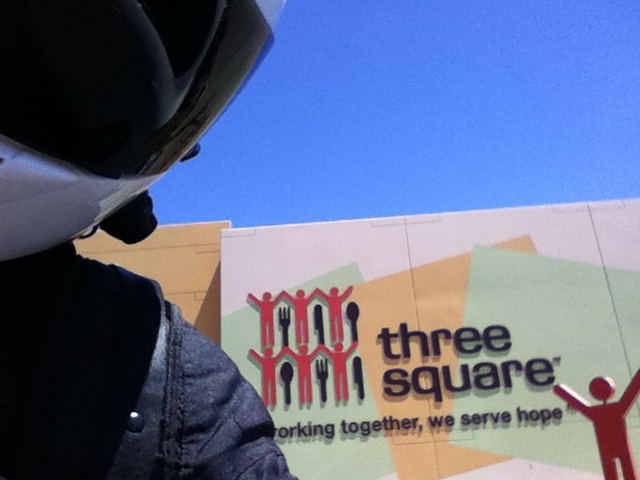 Leaving Three Square food bank main office on a mission. A forbidden mission. This day was the last day I got on the phone. Instead of heading home, which was my intent, because this was a VERY hot day… I took that piece of paper out of my pocket and entered the address on my GPS. I stopped at the first bus pass vending machine I could find and purchased a 24 hour bus pass. I then stopped at Albertsons and purchased a large turkey sub. Grabbed as many condiments that seemed reasonable and picked up a food gift card and put $10 on it. I followed the sweet female voice of google maps to the motel where this soon to be homeless veteran was staying… for one more night. I parked. I got off the bike. I left all my gear on. Took off my backpack and grabbed the albertsons bag with the goods in it. My helmet was still on. It was very, very hot. I knocked on the door. This hero answered the door. I introduced myself as the person who had just spent more than two hours on the phone with him trying to find help for him from veteran’s village and other local and veteran agencies. That look of embarrassment was on his face. There was next to nothing in the hotel room. Probably all that he had with him when he was dumped at Nellis. I opened my face shield about two inches. Enough that he could hear me, but not see my face or the fact that I was crying. Told him I brought a few things for him, asked him to use the bus pass the next day to make his first stop the food bank for a meal. I asked him not to reveal what I had just done. I turned around and left. Went back to my bike and rode home. THIS is the face of hunger. Chances are his food stamp (SNAP) benefit could/would be as little as $16/month… On that day in August, BUT NOT TODAY!!! As of today it’s less. I have no idea what happened to this hero and no way to find out. That was the last time I went tot he phone bank at the food bank to volunteer. Firs I need a week or two break and then I had the pulmonary embolism… time flies. It’s that ime of the year and I think I may go back to Thanksgiving and Christmas food boxes/crates because there is less emotion involved. Before I moved to Las Vegas I used to go to the post office in Atlantic City, NJ before holidays and they had a table setup where you could read letters to santa with christmas requests. I would scour the pile looking for letters from children who ask for nothing for themselves. They ask for others. A brother, a neighbor, a parent. I would choose these letters. Answer the wish for another or others as requested from santa and then providing gifts for these children even though it was not requested directly. They wanted nothing for themselves. This was as close as I could get to the pain of poverty… the pain of children. The pain of my own childhood that was still hidden inside of me and sealed tight/classified. My first Christmas in Las Vegas was 1998. I was asked what I wanted for Christmas and I replied: peace, love and happiness. It’s all I ever asked for. I called the main post office, explained what I had always done in Atlantic City and was told, we don’t allow this in Las Vegas. We turn letters to Santa over to local non government organizations (NGO’s). I asked for a phone number and was provided one. I settled on helping a family of five… working poor (in 1998) with the mother in a wheel chair, unable to work herself because of being hit by a car and a slow recovery from a back injury. I dropped about $500 in goods from Sam’s Club. It’s all I wanted for Christmas. Peace, Love and happiness and some food for others. Working boots for the breadwinner. A winter coat for the bread winner. There were no Christmas decorations in this house but a one foot tall tree on a table. It was too painful to see a family in this situation so I decided I can’t repeat this. So the following year I tried something different. I went to the Salvation Army tree at the Boulevard Mall and selected 12 children who had posted christmas wishes on little christmas tree ornaments, with shoe and clothing sizes and age. This became overwhelming and I had to use my most trusted lieutenant at the time to help me with my task (Jennifer R.) who went to walmart with me and helped me organize so much stuff for so many children. This was a little easier because I didn’t have to look in faces. I only dropped off bags labeled for each child. But again… overwhelming when working 12-18 hours a day. Most all of my friends or people need nothing. They have everything they need. So, I found myself sending greeting cards saying, your Christmas Gift went to this person or that person. Like my people needed a box of chocolate from me. After my first year here, I started drawing a salary and went from employee to business partner. Sweat equity for working a year with no salary and showing how I work and built the business. I could afford more since I was no longer living out of my savings as I had done the first year in Las Vegas. That year, the third Christmas in Las Vegas I decided on the Make-A-Wish Foundation www.wish.org. I called, introduced myself and said I wanted to donate, but I wanted to know the difference between donating to a wish and granting a wish. What was the average cost to grant a complete wish. It was so much easier to just write a check. I decided i wanted to grant wishes. Anonymously. The first wish was a computer, peripherals and accessories for a teen with brain cancer. $2400. I thought that would be easy. Little did I know, while I am at compUSA in Henderson, I would be at the customer service desk for a special order pickup and there was this small group of people in front of me exchanging a voucher for a cart full of goodies that any teen would envy. It was the teen that I wrote the check for. Here I thought I would be able to escape the emotion of giving and I was embedded in the middle of it. I walked and left the store… went back the following day for my pickup. I just couldn’t stand there. I saw the make-a-wish voucher, I saw the young man, shaved head with very large scars. I just had to leave. The next wish was for a family of four to take a trip to disneyland before the loss of a child to terminal illness. I knew it would be easier this way. The make-a-wish wish’s were granted until 2007, when I had to umm… stop writing those big checks. After this, all I could give was my time. It’s very rewarding. I give time in many ways and I know that what I do helps a lot of people. Between the food bank(s) and being on the phone, I think my donation(s) have more meaning. Partnering with another NGO providing guidance for people living with chronic illness. How to live a healthier and rewarding life. Learning all over again, how to take ownership of your own life and health when you feel you can’t. My shame, my embarrassment is because with all we have, all that we throw away, no one should go hungry. As I sit here with a kitchen full of healthy organic food and commodity, expensive organic coffee being sipped at this very moment, I know I’m not in need. I can buy my own more expensive foods and not have to worry (as much) about a budget or putting gas in the motorcycle. But I know there are many who can’t. Shame on those who would take from the poor to give to the rich. This embarrasses me to no end. It’s a disgrace and brings shame to my heart to know these people are Americans too. 5 Bob Marley Quotes to Live By!